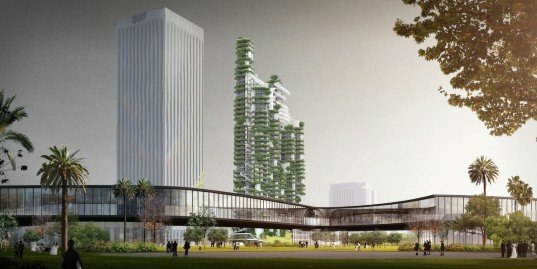 MAD Architects unveiled Cloud Corridor, a futuristic vertical village that brings nature back into the heart of Los Angeles. 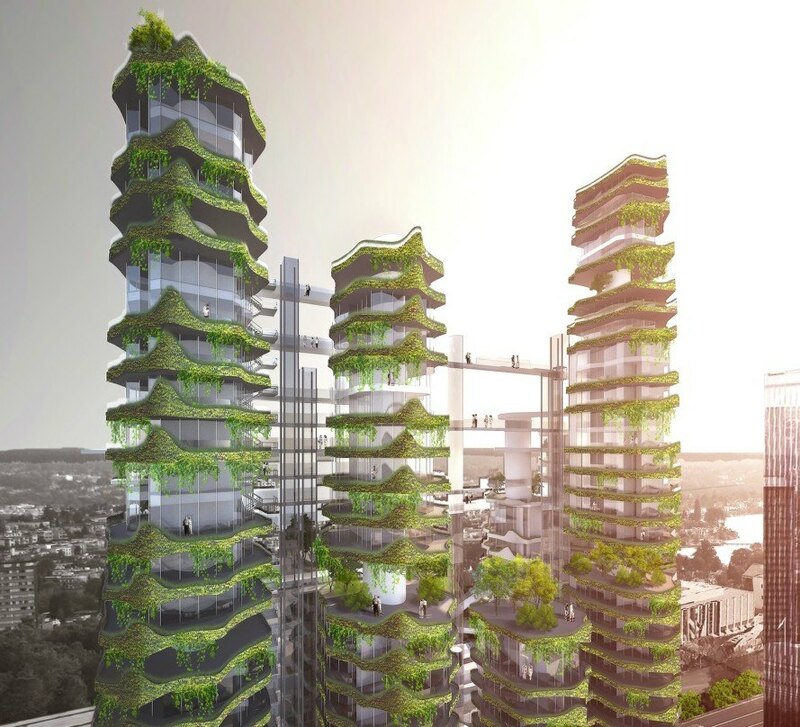 Created as part of the ongoing “Shelter: Rethinking How We Live in Los Angeles” exhibition at the A+D Museum, the lush urban landmark comprises multi-level vertical gardens draped overtop nine interconnected residential towers. The nature-filled skyscraper proposal is located across from the Los Angeles County Museum of Art on Museum Row. The futuristic housing model follows MAD Architects’ founder Ma Yansong’s “shanshui” design style, which heavily incorporates nature into architecture and even goes as far to shape buildings into organic forms like mountains. In addition to its nature-inspired form, Cloud Corridor was created with a tall and high-density footprint to challenge Los Angeles’ notorious reputation for sprawl. Like a vertical village, the nine towers comprise distinct neighborhoods connected via landscaped bridges, viewing platforms, and public gathering spaces that foster a sense of community. “Formally, the high-rise tower is a statement of power and social context,” write the architects. “Cloud Corridor reconsiders modernism’s residential tower typology and folds in the design philosophy that residential buildings should respond to nature and emphasize the environment.” An integrated green-roofed metro station sits below the Cloud Corridor. The metro station’s rolling landscaped roof serves as a public park and tilts away from the ground to provide a private-access lobby for tower residents and separate entrance for metro riders. The Cloud Corridor proposal will be on view at A+D Museum’s Shelter exhibition until November 6, 2015. The futuristic housing model follows MAD Architects’ founder Ma Yansong's “shanshui” design style, which heavily incorporates nature into architecture. An integrated green-roofed metro station sits below the Cloud Corridor. The metro station’s rolling landscaped roof serves as a public park and tilts away from the ground to provide a private-access lobby for tower residents and separate entrance for metro riders. Cloud Corridor was created with a tall and high-density footprint to challenge Los Angeles’ notorious reputation for sprawl. Like a vertical village, the nine towers comprise distinct neighborhoods connected via landscaped bridges, viewing platforms, and public gathering spaces that foster a sense of community. The nature-filled skyscraper proposal is located across from the Los Angeles County Museum of Art on Museum Row. The Cloud Corridor proposal will be on view at A+D Museum’s Shelter exhibition until November 6, 2015. The futuristic housing model follows MAD Architects’ founder Ma Yansong's “shanshui” design style, which heavily incorporates nature into architecture and even goes as far to shape buildings into organic forms like mountains. In addition to its nature-inspired form, Cloud Corridor was created with a tall and high-density footprint to challenge Los Angeles’ notorious reputation for sprawl. Like a vertical village, the nine towers comprise distinct neighborhoods connected via landscaped bridges, viewing platforms, and public gathering spaces that foster a sense of community.